Automates processing of slides for FISH (fluorescence in situ hybridization) and karyotype analysis. Controls wash time, agitation, buffer temperatures and drying using an integrated centrifuge. 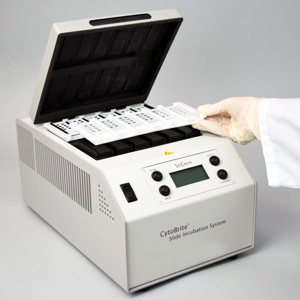 Batches of 1 to 24 slides are processed using SciGene or user-defined protocols. Performs G-banding and pre and post-hybridization processing of FFPE, bone marrow and blood samples for FISH. 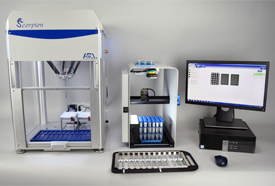 Can also be used with Agilent or Illumina microarrays with additional accessories. Request pricing or a quotation. Little Dipper Processor for FISH, 115V. Little Dipper Processor for FISH, 230V. Bath, Low Volume, Heatable (275 ml). Bath Covers, set of 5, for pre-heating. Bath Cover, Slotted, for Little Dipper 12-position slide rack. Bath Cover, Slotted, for Little Dipper 24-position slide rack. Slide Rack, 12-Position for standard 3 inch slides. Slide Rack, 24-Position for standard 3 inch slides. Absorbent Pads for 24-Position and Hybex Rack Buckets. Absorbent Pads for 12-Position Rack Buckets. Spacer for Rack Bucket, 2/pk. Fits Hybex and 24-Position racks. Spacer for Rack Bucket, 2/pk. Fits 12-Position racks. 24 Slide Rack Kit. Includes two 24-slide racks, large centrifuge buckets, spacers and pads. 12 Slide Rack Kit. Includes two 12-slide racks, small centrifuge buckets, spacers and pads.